Have you landed an unpaid internship for this summer? Want assistance in funding this experience? Career & Professional Development’s Summer Internship Award program provides eight $2,500 awards to undergraduate students in order to help offset living expenses. There are an additional four $2,500 awards for undergraduate students with international internships. Qualifying internships must be unpaid (internships with stipends and other monetary forms of payment are not eligible) and include a minimum of 200 hours during the summer of 2018. To be eligible to apply, students must be currently be enrolled full-time at DU and maintain their undergraduate status by registering as a full-time student in the fall quarter of 2018. To apply for the award, students must submit the online application and essay by 4:30 p.m. on Monday, April 2, 2018. The 2018 Career Center Summer Internship Award Program will award eight (8) undergraduate students and another four (4) undergraduate students working in international internships with awards in the amount of $2,500 for working a minimum of 200 hours at an unpaid internship during the summer of 2018. Internships with stipends and other monetary forms of payment are not eligible. Taking this internship for academic credit* is optional. Students must be undergraduates. Internships must be unpaid. Students must be currently enrolled at DU full-time and must maintain their undergraduate status through the summer by registering as a full-time student in the Fall Quarter of 2018. Students enrolled in a 3/2 or 4/1 graduate program are not eligible if they have started their graduate work. Previous grant recipients of the Career Center Summer Internship Grant Program are not eligible to reapply. University College undergraduates are not eligible to apply. Students who are doing an internship that is in any way affiliated with DU are not eligible to apply for funding from the Career Center Summer Internship Award Program. 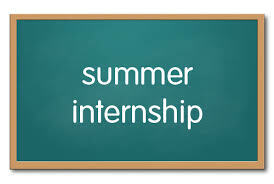 Students doing a research project with a University of Denver Professor or DU affiliated organization such as the Eleanor Roosevelt Institute are not eligible to apply for the Career Center Summer Internship Award Program. For more information regarding a grant program designed specifically for research at DU, please visit the PINS Program website. Submit the online application form and essay by 4:30 p.m. on April 2nd. It is recommended that students have already accepted and secured a summer internship by the application deadline. Students who have not secured an internship by the application deadline may still apply but must be in active pursuit of an internship opportunity. Receipt of the award money will be contingent upon finding a summer internship no later than May 2, 2018. If you have a specific question about a particular internship, please contact career@du.edu. *Students who would like to get academic credit for their internship must meet all eligibility requirements established by their academic department. Students are responsible for finding a faculty advisor in their academic department and obtaining approval to receive academic credit for their internship prior to the start of their internship.